It’s interesting to observe how the colors of the late day sun affect a bird’s appearance. The Red-Bellied Woodpecker above that I spied on a recent early evening walk, certainly looked like he was enjoying the last rays of sun. 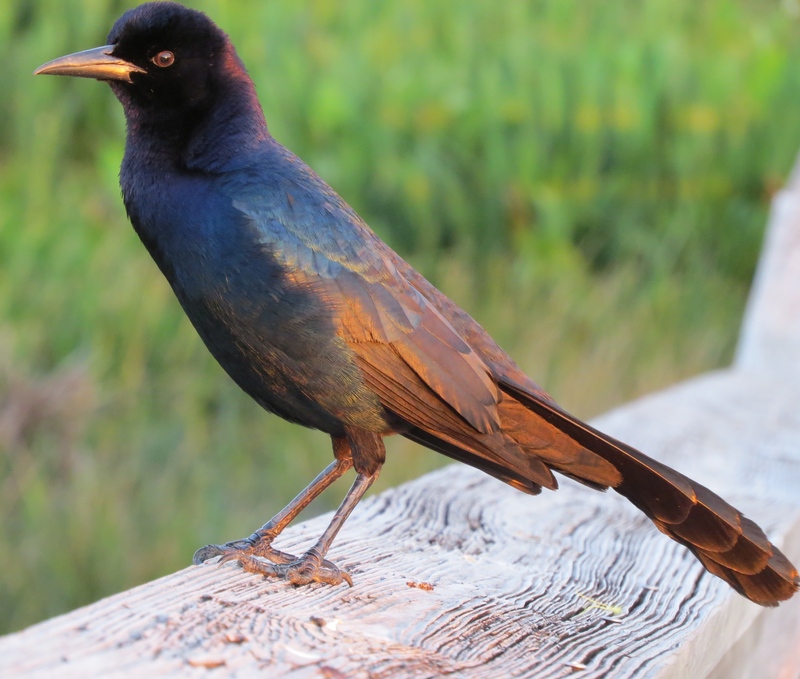 We usually see the Boat-tailed Grackle above in his brilliant, shimmering blue feathers in the daytime sun. But yesterday, his feathers were transformed into a rust color in the waning sunlight. Frankly, he looked like he’d just accidentally fallen into a paint can! 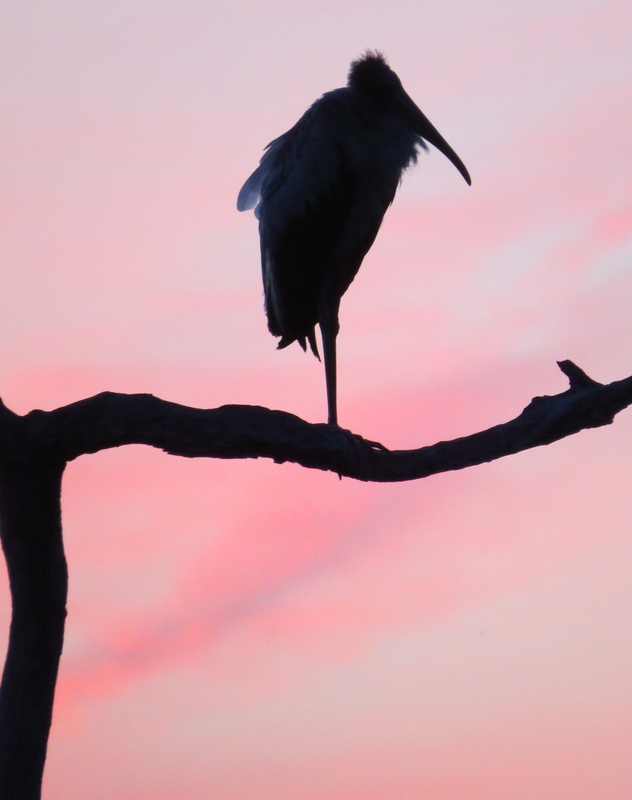 Less than an hour after I saw that Grackle last evening, the deep pink sunset created a dark silhouette of this Wood Stork posing on one leg on a tall crag. 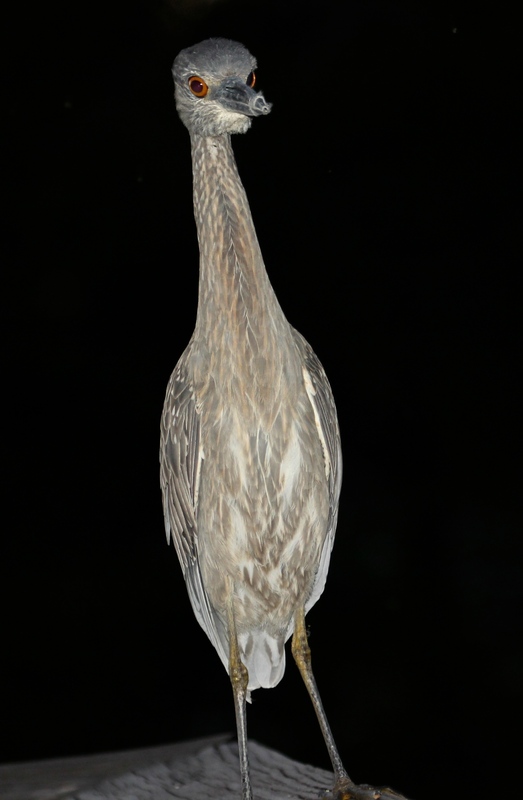 The Limpkin, tinted orange by the diminishing light at dusk, was squawking away as usual, and probably looking to impress his peers. He does a great job of making his presence known, as anyone who has a Limpkin as a neighbor can attest! One of my favorite sightings this spring was the delightful little Ovenbird, who would always appear on my evening walks. I’ve never managed to get a really good photo of him in the dark and secluded little wooded area he frequented. He is a master of camouflage with his multi-colored body, and orange head stripe – he blends right in as he hops about on the forest floor among the leaves and twigs. Since I often walk in the evening, and can’t bear to leave till it is literally dark (! ), this seems a logical blog post in which to include (below) some other photos-in-the-almost-dark that I’ve taken of my wetland friends. 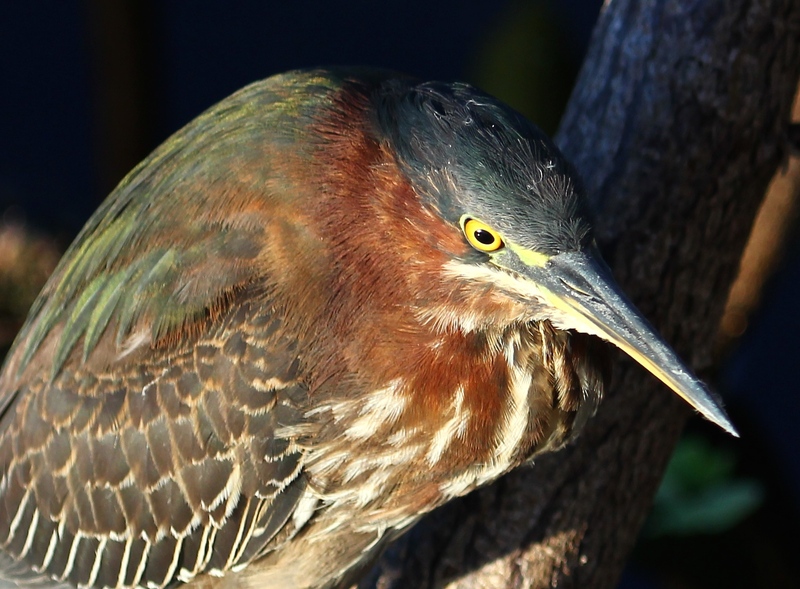 This entry was posted in Birds and tagged American Bittern, Boat-tailed Grackle, Green Heron, Limpkin, Night Heron, Ovenbird, Red-bellied Woodpecker, Sora, Wood Stork. Bookmark the permalink. 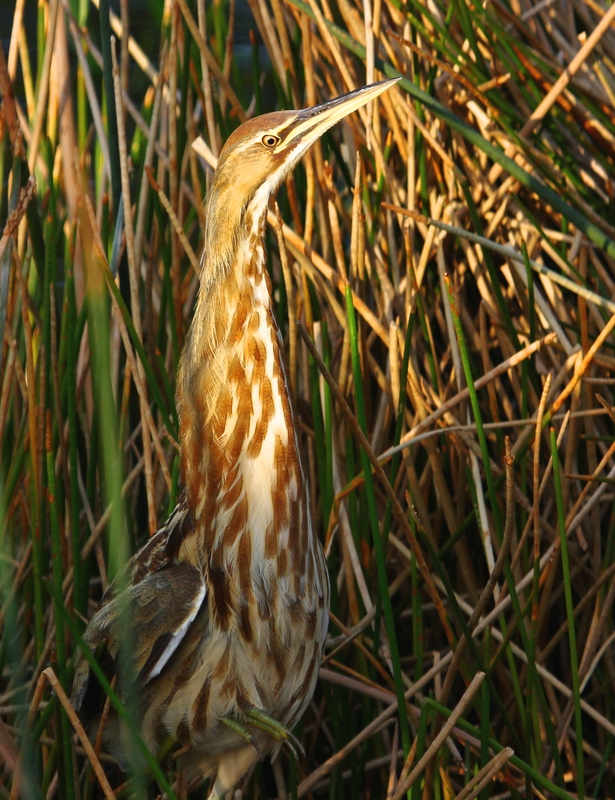 The Limpkin is an interesting bird I have not seen before, I think it is known as the crying bird. Does it show breeding plumage? Thanks, Aussiebirder! 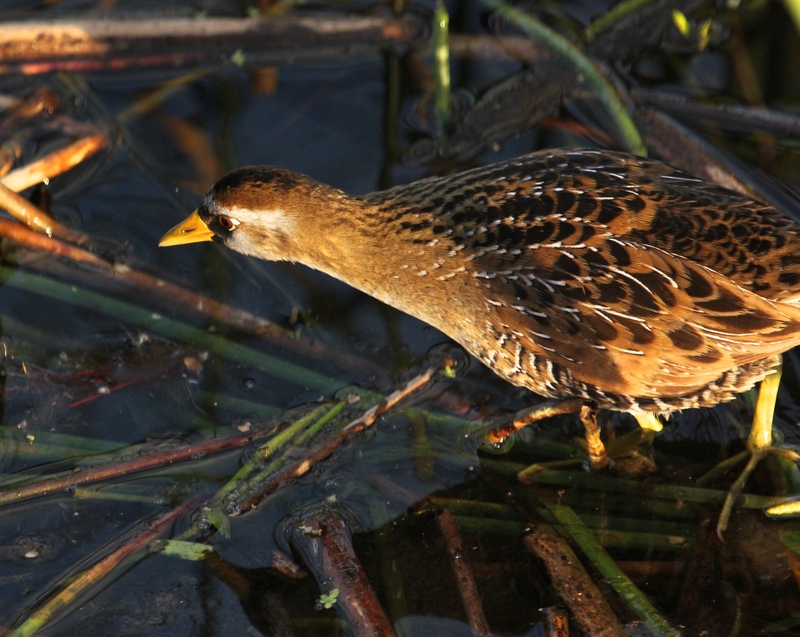 Yes, the Limpkin does sound like a human in distress at times – and it’s sometimes known as the Crying Bird. Honestly, I think the Limpkin’s eerie, piercing cry causes distress in humans if they’re close to an open bedroom window! I personally can’t see any obvious differences in their coloring during courtship, and males and females both work on nest-building and childcare :). I guess there are some behavioral differences, though, and the Florida Fish & Wildlife folks say, “Courtship feeding of the female by the male imitates an adult feeding a juvenile”. Fascinating – I didn’t know that! Thanks for sharing that cool tidbit. Thank you for your visit and your kind words, Amy! Yes, that little Ovenbird was a first for me – hope we see him again next year. Beautiful images. It’s a joy to hang around as the light starts to fade, but a real challenge to getting good photos. You managed to capture quite a nice assortment of interesting birds. Thanks, Mike. I’m fortunate to have an amazing variety here in our local preserves. And someone is always out and about, no matter what time it is! I get out infrequently in the evening, but so much like photos of the birds at that time – like you have shown. The colors are different and many times just a bit dreamier. Lovely photos. Thanks for visiting and sharing, Donna!